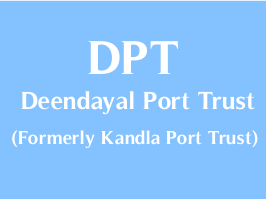 Deendayal Port Trust (Formerly Kandla Port Trust) has published Advertisement for below mentioned Posts 2017. Other details like age limit, educational qualification, selection process, application fee and how to apply are given below. M.B.B.S. Degree from a recognized University and registered with Medical Council of India. Experience: Minimum one-year post qualification experience in a reputed Hospitals /Govt. Department Hospitals, after completion of Internship of one year, is essential. The candidates, who possess, PG Degree or Post Graduate Medical Diploma in the Specialty of General Surgery from a recognized University, will be engaged as Specialist. Experience: Post qualification experience of 3 years for PG Degree holders and 5 years for PG Diploma holders in a reputed Hospitals/Govt. Department Hospitals is essential.